This show will have you see things in a way you never thought of and laugh at topics you never thought you would ever find hilarious. 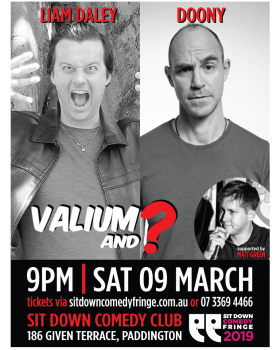 Featuring Aussie larrikin and punter's champion, Chris "Doony" Muldoon, and a dose of Valium in Liam Daley, the show is a little cheeky, a little edgy, a bit questionable, and contains a lot of laughs. These two rising comics will be supported by the innocent looking, but not so innocent pontificator, Matt Green.